Groth Music Company - Roosebeck Sheesham Practice Chanter Nickel Plated Ferrule & Sole 19"
Folk Instruments > Bagpipes & Chanters > Roosebeck Sheesham Practice Chanter Nickel Plated Ferrule & Sole 19"
Our most popular model. 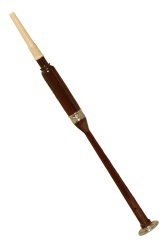 Traditional size, engraved nickeled ferrule, sole rosewood body, plastic reed. Played by itself, this is the first step to learning the bagpipes. Includes reed. Key of B-flat. Wood Grain may vary. Approximately 19 inches long assembled. The stock on our chanters is approximately .595 -.61 inches (around 9/16-5/18") in diameter.